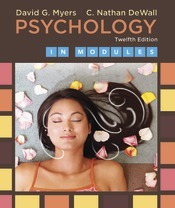 The new edition of Modules includes the same new features and content of Psychology, Twelfth Edition, including hundreds of new citations and new infographics, And like Psychology, Twelfth Edition is more than ever a fully integrated text/media learning package, with the modular edition’s LaunchPad now featuring dozens of new Concept Practice activities. Achieve Read & Practice combines a complete eBook with LearningCurve adaptive quizzing. For more, see New to this Edition.